CES is one of the largest electronics and technology trade shows currently out there. They just completed their latest one this past January and the trucking industry wasn’t shy about getting involved. There were several companies touting self-driving vehicles that they hoped to have on the roads in the next 5-10 years as they continue to refine technology and regulations around the trucks. A lot of this technology led to some conversations around what this will mean for truck drivers and carriers both. We wanted to breakdown some of those theories to let our users think about the direction trucking might be headed. It should be noted that this is all speculation and as technology changes, so will these theories/outcomes. The biggest viewpoint that has been pretty predominant is that self-driving long haulers will essentially wipe out the need for truck drivers in general. Carriers and shippers will want the automated trucks so they no longer have to abide by the human regulations setup to avoid things like exhaustion and labor laws. This theory has it that there will be fleets operated by one or two people monitoring each trucks system to make sure things go smoothly. A new theory we have seen is much less grim and actually positive. Their thought is that the United States could see an increase in the amount of trucking jobs that become available in the states (and elsewhere). The thought is that many of these autonomous driving trucks won’t be able to successfully handle being downtown in a busy metro trying to squeeze into a tiny shipping space. 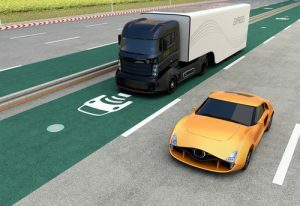 Instead, the thought is that these trucks should be able to self-drive between each trucking hub that would then require the human to take over. If that would be the case, the requirements around gaining a CDL could be completely transformed as well as what constitutes “hours driven” by the human driver themselves. It would be likely that if a driver could sleep for 3 hours during that stretch between hubs, the legal amount of hours on the road could actually change. If gaining entry as a driver while also making the job a bit less stressful by having the truck on auto-drive between hubs occurs, many believe that an increase in drivers and work would follow. All of this is speculative at best and there are a lot of factors at play. It is an exciting time to follow the newest technology and trends as they develop in the trucking industry!